Dealing with many if not all the main issues of existence, this work provides a valuable handbook of practical wisdom for any inhabitant of planet earth in the 21st century. To be sure, the reader will probably need the equivalent of a college education to appreciate the range of the book’s table of contents without even considering its answers. Thus, the first chapter addresses “Disillusionment: the end of history has been postponed”; the second chapter, “Work, when you grow up, you may not have a job.” Later chapters examine “Justice: our sense of justice may be out of date” and “Post-Truth: some fake news lasts forever.” The book’s range of subjects could be seen as a collection of aphoristic nuggets, but the author’s 21 lessons concern fundamental problems of all ages as well as those of the present century. Harari, author of Sapiens: A Brief History of Humankind and Homo Deus: A Brief History of Tomorrow, is a professor of history at Hebrew University. The chapter on Religion cautions that God now serves the nation. Harari suggests that a decent moral code can emerge from reason and empathy, no need for a flaming bush. Morality does not mean “following divine commands” but simply “reducing suffering.” Compassion does not depend on complicated theories. Just understand that hurting others will hurt you too. Secularism is an active worldview defined by a coherent code of values rather than by opposition to this or that religion. The most important secular commitment is to truth (as it was for Gandhi, whose Autobiography bore the alternative title My Experiments with Truth). But Harari also warns us not to take the name of God in vain and that secularists must acknowledge their own shadow, which could include overconfident dogmas about socialism, capitalism, and human rights. Marxists must ask how did the teachings of Marx lead to the gulag? Scientists must ask how faith in science led to destabilizing the ecosystem. Harari writes that “the only place rights exist is in the stories humans invent and tell one another.” These stories have helped weaken bigotry and autocracy, but they now confront challenges from biotechnology and AI. “If we are committed to the right of liberty, should we empower algorithms that decipher and fulfill our hidden desires?” Human rights dogmas will not protect us against consumerist excesses and technological utopias. The chapter on Meaning notes that many secularists want to leave something tangible—cultural, like a poem, or tangible, such as genes. For those who do not trust these potential legacies, the safest story they can turn to is romance. Like Romeo, connecting with the cheek or hand of his beloved, one can feel connected to the cosmos. The big stories, such as Christian or Muslim faith, are human artifacts. So are Confucian rituals, but they have helped steady and perpetuate Chinese civilization for millennia. Seeking a more powerful narcotic, many people are swept up in nationalistic fervor. Unfortunately, in real life evil may not be so obviously ugly as Voldemort. Exposed to all the candidate stories, a liberal may discover that all the stories are fakes. There is nothing outside me to give meaning to my life. I imbue everything with meaning through my own free choices and my feelings. I am free to create my own dharma. But, Harari says, this liberal story is also fake. Our creations and feelings result from billions of neurons exchanging biochemical signals—as ruthless as the Inquisition or the KGB. According to the Buddha, however, life has no meaning and people do not need to create meaning. But even Buddhists fight for temporal power. 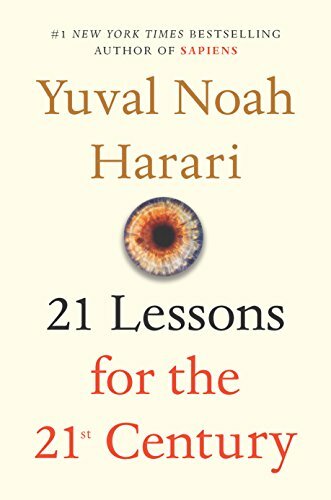 Harari concludes that the best way to learn about yourself and the meaning of life is to observe the suffering of a wounded soldier, a brutalized woman, or a child shaking with fear. The answer is not a story. His own approach is summarized in the book’s final chapter, Meditation. The author of three best selling books sits for an hour each morning and evening and concentrates on his inhaling and exhaling. For him, there is no conflict between mediation and scientific research.